Are captive piston firearms normally a looser fit in the rifling..... or a smooth bore?....assuming the energy transfer from the piston would be limiting in terms of velocity and length of barrel since there is no gas pressure pushing the bullet down the barrel. Is there much known about velocities and accuracy and all that? Guessing it is a very small powder charge since there is nowhere for the pressure to go when the piston reaches the end of its travel. The myopic majority will be our republic's undoing. 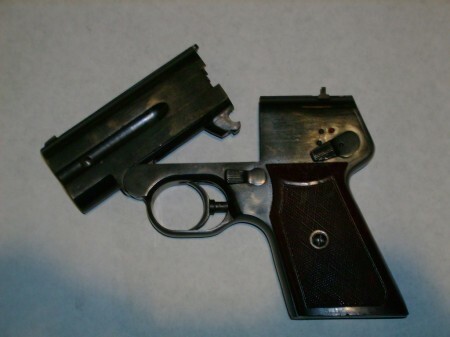 The Soviet PSS was rated somewhere around 650 fps and the bullet/projectile engaged the barrel rifling with a brass band that accounted for a small percentage of the bullet/projectile length. So ... rifled and semi "loose" in that none of the 150 or so grain steel bullet/projectile intentionally directly engaged the lands. Accuracy was probably mediocre past 10 yards but I think it was designed for distances more like within 10 feet. Not sure about rifling or fitment of other captive piston designs. It would be an interesting project.... a snub nosed BP revolver would be fun. Only the chamber would get dirty.... everything else could be dripping with bore butter or grease of some sort. I saw one many years ago that was smoothbore and little more than a long chamber. The bullet never touched the barrel.I can't see any reason to use rifling unless it was for deception ie: to hide the fact of a close range shot happened making people think a sniper was at work. I think that to do this in black powder you would need a sabot type piston that would be stripped from the sub bore projectile and seal the bore.You will need to use a primer than will contain the pressure as well.This could be done using a pepper box pistol fitted for modern pistol primers.I would say its feasible. If captive piston ammunition is on the table why build a gun? Use a snub nose Taurus Judge and build your ammo around 3" 410 shotshell dims. All the designs pictured are intended as concealed/hit guns but would conceal-ability be an issue here? A large bore derringer or a break action single shot like a Contender would also work as an easy platform. No stamp required. I seriously question the strength required in the case and barrel to stop that piston though...that's gotta try to bulge the barrel via spreading the case mouth. I bet the case is smoking hot too. We were discussing building a non NFA Black-Powder weapon. Captive piston ammunition would require a 200$ tax stamp per shell using a modern gun.You might need to wait 6 months between reloads in a gun fight! I get that and was following the ML BP integral discussion with some interest. The discussion swerved to the captive piston ammo. No where have I seen that those would require a stamp. It is not a firearm part...seems to fall into a gap in the law from the little I have studied the language. What section of the code would cover it? If each round required a separate stamp a la the rules for a DD that is a whole 'nuther story. I am no expert, but it would seem logical (I know logic and NFA don't normally go in the same paragraph) that captive piston ammunition made for a standard "firearm" (as they are defined) would be a device designed to quiet the sound made by firing that firearm......so each individual round of ammunition would be considered a suppressor. What we were discussing was creating a blackpowder rifle/pistol etc. that has the chamber designed to use the idea of a captive piston method for propelling the bullet to in effect create an unregulated suppressed pistol/rifle. Did that make as much sense in print as it does in my head? ....so each individual round of ammunition would be considered a suppressor. From previous explorations of this topic on this site this was the conclusion. Designing the chamber for captive piston may avoid the cased ammunition caveat. It would be awkward to reload, but it wouldn't be a cartridge....and it would limit the majority of the fouling to the cylinder/chamber. Is the use of cartridge type ammo (regardless of the propellant) the line the turns a BP rifle/pistol into a firearm? At the very least I believe it would bring it under purview of the NFA based on their definition of a firearm. But I'm running off memory of some very tangled regulation and might not be remembering the details exactly correct. ETA: A rifle is a firearm designed to be fired from the shoulder and designed to use the energy of an explosive in a fixed cartridge to fire only a single projectile through a rifled barrel for each single pull of the trigger. But wait there's more. Also, shot shells provide an interesting twist wrt AOW if I recall correctly. Section 2.2 Antique firearm. Firearms defined by the NFA as “antique firearms” are not subject to any controls under the NFA. The NFA defines antique firearms based on their date of manufacture and the type of ignition system used to fire a projectile. Any firearm manufactured in or before 1898 that is not designed or redesigned for using rimfire or conventional center fire ignition with fixed ammunition is an antique firearm. Additionally, any firearm using a matchlock, flintlock, percussion cap or similar type ignition system, irrespective of the actual date of manufacture of the firearm, is also an antique firearm. NFA firearms using fixed ammunition are antique firearms only if the weapon was actually manufactured in or before 1898 and the ammunition for the firearm is no longer manufactured in the United States and is not readily available in the ordinary channels of commercial trade. To qualify as an antique firearm, a fixed cartridge firing NFA weapon must meet both the age and ammunition availability standards of the definition. It's my understanding also that modern captive piston ammo is considered a suppressor in itself as mentioned.You can own a non NFA DD if you use non fixed ammo.Technically the 16x50 caliber main guns off a Iowa class battleship are non DD but the shells are if explosive! I know we wondered off course but that's not new around here. Here's an old thread on an integral captive piston revolver. Maybe my Google-Fu has failed me but in my searching I found a lot of discussion concluding the same, but nothing with any authority. No letters. No sections of the pertinent law/codes. Since it is an ammunition type, why is it any different than primer powered and low power ammo that is also designed to reduce report? I know, logic has little to do with it. So back to the original design discussion, I come back to the long cylinder of the 410 shotshell pistols. Build a custom cylinder and does that change it to a cap and ball BP antique firearm classification or does it need to start out as a cap and ball cylinder revolver to escape the atf's attention, or is this a 1 way deal like the 45 colt conversions to the old 45 BP revolvers? The whole captive piston thing is fun to think about ways of making it work… But when it comes down to it I still gravitate more towards stuff with a little more accuracy potential, so probably an integrally suppressed BP rifle would be more interesting since it would be unregulated as well. does that make CCI .22 quiet suppressors?? seeing as they are manufactured to make the gun quieter?? Ammunition that is low powered is not the same as a firearm or a munition type designed to reduce report! Velocity control is often used depending upon game hunted or for gallery use where high velocity is not needed. Target shooters mostly use subsonic ammo because its more accurate.I normally use subsonic on live small game so less meat is wasted. You would need to use a cap & ball revolver converting the other is not allowed as its already a firearm......passage escapes me. Using a pepper box is far more practical as the bullet never touches the barrel in most designs. I love the discussion, but don't want to derail CL's post too much. Whether or no the ATF would like to say the ammunition would be a silencer, due to reducing the report, I don't think they'd have a legal leg to stand on. The definition of silencer specifically states "device". Ammunition has its own definition and no where does it define ammunition as a "device". If ammunition could be a silencer, ANY subsonic ammo could be subject to this. I don't know that I've ever seen anything in print either. To me it would not be an entirely invalid argument to say if captive piston technology constitutes suppression that may be regulated under the NFA by the BATFE then CCI 22 Quiet logically falls into the same category since it reduces the report of a firearm as compared to something like CCI Stinger. My point exactly, ammunition is ammunition, firearms and devices are not ammunition, and captive piston ammo seems to fall between the definitions...much like muzzleloaders and smooth bore AOW's (pistol grip only shotguns). I do not want to be the test case, but it is a very intriguing line of thought. I could see applications all over, Snakeshot revolver loads, slugs for knocking down pigs in a trap, etc but hearing safe. A obturation device other than a bullet is not listed under the definition of ammunition and is clearly designed to diminish the report of a portable firearm. A low level powder charge is not listed and therefore legal. 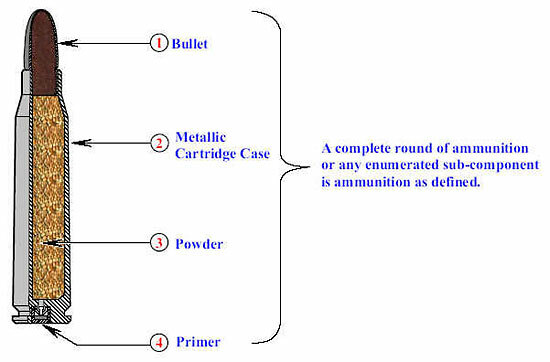 The process of a bullet expanding under pressure to fit the bore of the firearm, or a cartridge case expanding under pressure to seal the chamber. I'm thinking it's not a fight I want to pick with the ATF regardless of what is or is not in print. No need to beat me over the head with the big fancy words.